The Ace of Cups is one of the most promising cards in the Tarot deck. The Ace itself represents a burst of energy that will come with new opportunities. 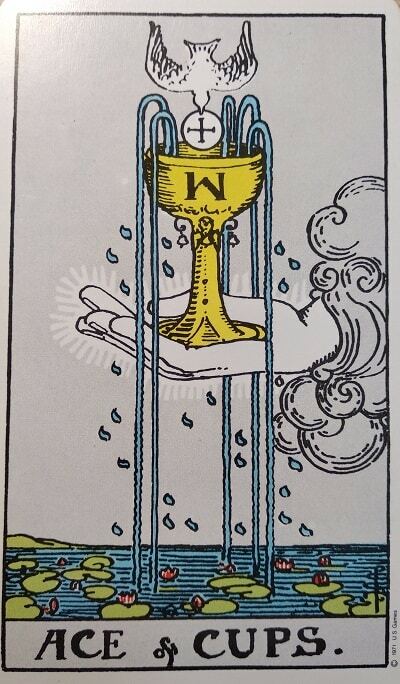 The Suit of Cups is related to the water element of feelings and emotions. When the Ace of Cups Tarot card appears in a spread, you can expect a significant flow of positive emotions in your life. Joy, gratitude, and satisfaction are some of the feelings that are going to come your way. Romance may enter quickly into your life. This will spark your dream world of fantasy, love, and creativity. When the Ace of Cups appears reversed, it means there will be some form of stagnation period. This may include pessimism or relationship problems. Emotional tiredness or weakness are also very possible. As a result, these issues will need to be addressed and overcome to move forward. Find out what this Minor Arcana tarot card means when appearing upright or reversed in a spread, in terms of love, health, work and money! Upright: Happiness, intimacy, harmony, compassion, love, creativity, rich fantasy, ambivalence, clarity, prosperity, abundance, self-confidence, validation, revitalization. Reversed: Lack of love, relationship problems, infidelity, lack of desire, confusion, disappointment, change of heart, losing faith in the relationship, stagnation, fear of commitment, cold feet, fear, anxiousness, second thoughts. 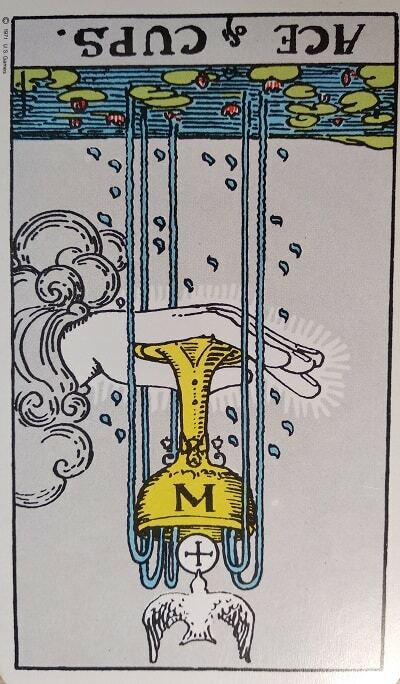 In the Aces of all four suits of the Tarot, we find a hand coming out of a cloud, or “out of the blue.” However, the landscape and the central object changes in every suit. In the case of the Ace of Cups, we find that the hand floats in a cloud near a lake full of lotus flowers. The hand holds a golden cup which is marked with a W, and five streams overflow from the cup into the lake below. A white dove is flying down carrying a communion wafer in its beak and is about to dive into the cup. We can also see a white circle with a cross inside. This circle is being carried by the dove into the cup. The first thing that we notice when looking at the Ace of Cups Tarot card is that a right hand emerges from a cloud. This hand is a spiritual symbol that a positive influence is coming to support our spiritual growth. The five streams overflowing from the cup are connected to our five senses. These streams represent a sense of sheer abundance and our core emotions. The lotus flowers, which grow lavishly on the bed of water, represent the lush and flourishing emotional garden within us. The dove is a symbol of peace and a manifestation of pure energy. When an Ace appears to us in a Tarot reading, we are being handed an unexpected gift, as if we are being granted the purest form of giving and receiving. 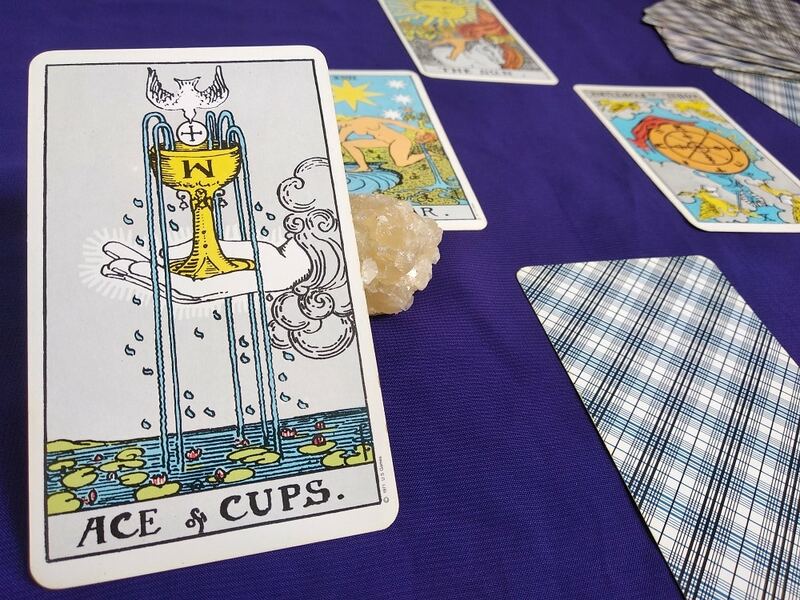 In the Tarot reading, Cups relate to vitality in all of its manifestations: breast milk, wine, water, or the oceanic depths of the unconscious. Learning to cope with emotions is essential in order to access them in their purest form. Dealing with feminine energy is vital to healing emotions. Energy from the Moon and water is supposed to be reflective. If your emotions are turbulent, this means that there is something that you have not healed. The lesson here is that you must heal if you are to be given the opportunity for romance, spirituality, and creativity. If your emotions are too intense, try to find outlets for this energy through art, fantasy, and spontaneity. When the Ace of Cups appears upright in a reading, it announces good news with respect to your inner world. Emotional healing has come full circle. You may be ready to begin a new relationship. You may also find new outlets for self-expression through creativity. Your imagination is suddenly fertile. Therefore, fantasy and dreams can lead to joy and happiness. On a romantic level, you can expect love, calm, and tranquillity. It may come in the form of a love energy so strong that it will help you heal from everything you have suffered so far. On a personal level, your self-confidence and self-esteem are improving. Keep up the good work! When we do a reading asking about someone’s love life, and the upright Ace of Cups tarot card appears, it represents a very positive time for that person’s life. Their current relationship will get stronger. There may be a sudden proposal or a happy wedding. Romance will become very deep and spiritually rewarding. A happy love life is represented here. If single, a new love will come into the person’s life. This will be a love full of tenderness and opportunities that will make them feel rejuvenated. This card can represent a very healthy body, mind, and spirit. The Ace of Cups is a great omen for good health when you are trying to conceive. It signifies fertility and reproductive health. Therefore, the Ace of Cups can also announce a pregnancy, so it would be a good idea to check and see if another “fertility“ card, such as The Empress, appears in the spread. In the case of illnesses, the card can represent a gradual recovery and healing. It can also represent emotional support from your loved ones to overcome any obstacle. The upright Ace of Cups signifies raises, promotions, celebrations, and awards for your efforts and dedication. New job opportunities, new contracts, or new clients are coming your way. Allow the cosmos to reward your perseverance and dedication. It is important to accept help from others. You have great charisma right now, and team projects will have great results. Although it is a card that mainly represents emotions and relationships, the Ace of Cups tarot card also brings financial prosperity. You will have new opportunities and customers that will translate into new profits. Likewise, fortune will be on your side. It is time for new investments, which will result in an increase in revenue. Money that is attained now will also help with emotional security. When Aces are upright, they speak to a rush of energy that will change your life. In the case of Aces reversed, they indicate that progress will be stalled or stopped. In terms of the Ace of Cups, this stagnation may be related to a feeling or an emotional situation. This card advises that you take time to heal and allow yourself to love again. During this time you may be overwhelmed. So, repressing your emotions will only hurt you more. However, losing control or hurting your loved ones is not an option either. You will have to learn to set limits in both directions. Finally, the reversed Ace of Cups can indicate that you are emotionally entangled in a relationship that will not move forward. It may be because you both need to work on communication, or it may be because there are trying and emotionally draining incompatibilities that need to be overcome. The presence of the reversed Ace of Cups tarot card can indicate that you are going through a period of emotional instability. Your emotional ups and downs may start affecting your relationship. Anything is possible, and this card can actually mean that emotional difficulties can no longer be swept under the rug. Therefore, these difficulties need to be dealt with in a new way. Perhaps therapy or a new way of bonding with your partner is necessary. For singles, the reversed Ace of Cups can refer to difficulties in creating new bonds. Your emotional baggage may be stopping you from starting a new relationship. You could have lost your faith in love. It is time to take immediate action to resolve these challenges as it is detrimental to your emotional well-being. The reversed Ace of Cups refers to physical health ailments related to mental and emotional health. When we do not control our emotions, our body reacts by creating symptoms and illnesses. Headaches or backaches, general fatigue, fever, and stomach problems are some of the most common signs and symptoms that can appear. These come about when we do not allow ourselves to process our feelings in a healthy way. Anxiety and fear can also manifest within us if our emotions are not healed. Willingness to love, accept therapy, or adhere to another form of spirituality is required. Do not lose your determination and passion! Even if you do not feel your efforts are being appreciated, have faith in yourself. You will start seeing things come together if you set goals and work hard to achieve them. You will reap what you sow sooner rather than later. It is time to analyze your emotional relationship with money. Belittling your own professional value can put you in economic difficulties. Thus, you will only overcome this when you dare to recognize your skills. Also, give yourself credit for your quality of work. When the Ace of Cups tarot card appears reversed, your finances and investments are not in danger. However, you might be overspending as a way to cope with your emotional problems. On the other hand, some people tend to neglect themselves because they are focusing exclusively on their plans for the future. Therefore, remember to live in the moment instead of obsessing about your future plans.